Wave of innovation to revive camera market? Nikon Z7 with the FTZ lens converter and a Nikkor 24-70mm lens. Viewed from the rear view mirror, Photokina 2018 – the last of the biennial shows – was a fairly tame affair as most major announcements were made well ahead of the show. Panasonic’s entry to full-frame was also much heralded on the rumour sites and the main surprise was to see two cameras instead of the anticipated one. Sadly for many, Sony’s anticipated α7S III camera failed to materialise but may appear before the end of the year, along with one or more APS-C cameras. If not then, CP+ in Yokohama late next February could be the date. So while the entry of more camera brands into the full-frame mirrorless category was perhaps a predictable part of the narrative, there were two unexpected announcements which will have on-going implications for the imaging industry. The first was the new L-Mount Alliance involving Panasonic, Leica and Sigma, based upon the existing Leica lens mount. This is BIG news; not only because it will challenge the market dominance of Canon, Nikon and Sony, but because it provides some interesting alternative products to the often similar and iterative products offered by the majors. This doesn’t mean the majors are in trouble (as some websites have claimed); it just means camera and lens buyers will have additional products to choose from. More details on this announcement below. The second is Fujifilm’s collaboration with Phase One to bundle a ‘light’ version of the popular Capture One raw conversion software with Fujifilm’s interchangeable-lens cameras. This will be widely welcomed since Fujifilm has been stuck with the deplorable Silkypix-based software since the first digital ILC the company offered. 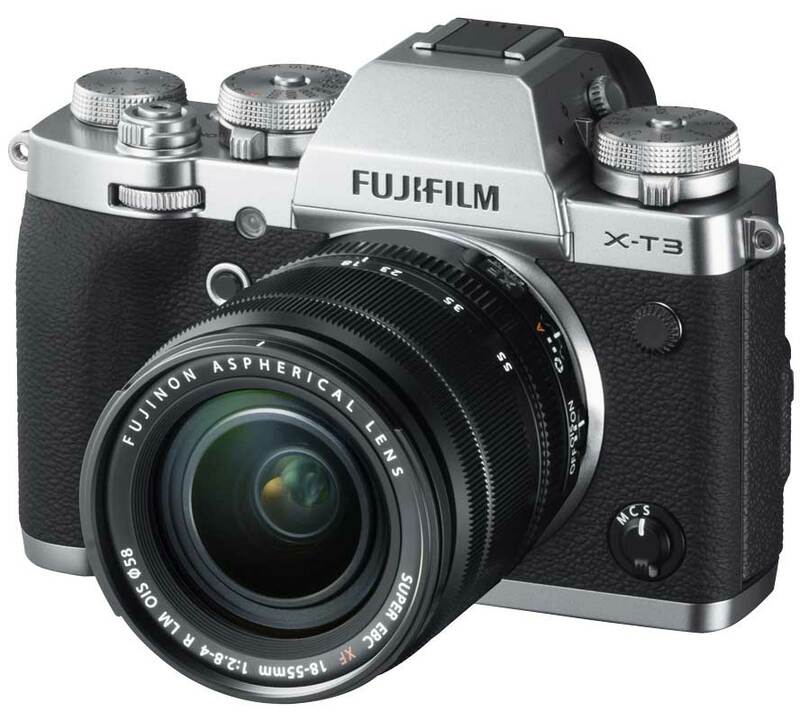 For the first time, owners of Fujifilm cameras will have access to professional-quality software to match the capabilities of their very competent cameras, of which the X-T3 is the most recent release (again well ahead of Photokina). Capture One Express Fujifilm will be available free for all Fujifilm camera owners under similar conditions to those that have operated for Sony’s α7 and α9 cameras for a number of years. It will provide both RAF.RAW file and basic tethered camera support for the GFX 50S, X-H1, X-T3, X-T2, X-T1 and X-Pro2 cameras and raw file support for the rest of Fujifilm’s line-up. Film Simulations support will be provided in an upcoming release and photographers who wish to access the full functionality of Capture One Pro will be able to purchase the Fujifilm-compatible version for US$159 for 12 months pre-paid; US$16/month for monthly subscription; and US$23/month for a three-month subscription. Aside from the manufacturers mentioned above, the other camera manufacturers were relatively quiet – if not totally silent at this year’s show. Olympus had nothing to show at Photokina this year; not even the anticipated E-M5 Mark III, which is odd when you realise that 2018 marks the 10th anniversary of the M4/3 format (and 16 years since the Four Thirds sensor concept was introduced at Photokina 2002). Its only presence was a ‘Perspective Playground’ where visitors could handle existing equipment and a press conference in which European CEO, Stefan Kaufmann, reinforced the company’s commitment to the M4/3 system. Maybe there’ll be something new to show at CP+; we certainly hope so. Pentax was even more subdued, which is concerning because it lacks a mirrorless camera at present. Ricoh Imaging, Pentax’s parent, announced the development of a new GRIII compact camera with a 23.5 x 15.6mm 24-megapixel sensor and a fixed 18.3mm lens. It has no viewfinder and other specs are fairly ordinary so even though it is relatively small and light, it’s a niche product. Along with 12 forthcoming lenses announced at Photokina and the 24mm f1.4 G Master, the Sony full-frame E-Mount lens range runs to 60 – a challenge for the newer entrants. Sony, which has ‘owned’ the full-frame mirrorless market for the past few years, attempted to fill the camera void with lens announcements. Rumour says the delay in releasing the α7S III is because Sony needs more time to ‘go beyond the customer’s expectations’, the insinuation being to compete effectively with Panasonic’s coming S1 and S1R cameras (see below). 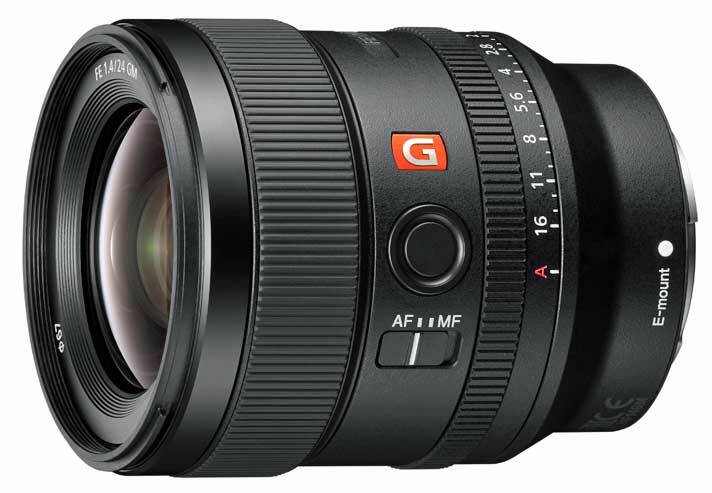 The pre-Photokina announcement of the 24mm f1.4 G Master took some of the wind out of Sony’s sails, although the company made use of Photokina to announce 12 more E-mount lenses that would be ‘arriving soon’, bringing the total to 60 lenses. Sadly, little was offered in the way of product details or potential release dates. However, Sony indicated it was prepared to share the basic specification of its mount with other manufacturers to strengthen its position in the marketplace. It’ll be interesting to see who takes this offer up. Sony also had plenty to say about how the integration of AI (artificial intelligence) in new products would make Eye AF work for portraits of animals. It also outlined potential extensions of their technology platforms through third-party alliances – but, again, no names were mentioned. A sharper focus on product ergonomics and user interfaces may be required if Sony wants to defend its leadership in the full-frame interchangeable lens camera market. 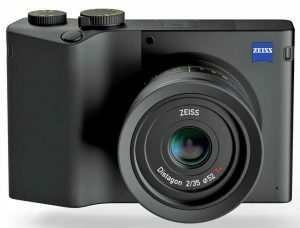 The Zeiss ZX1, the premium lens-maker’s first digital camera, has a massive LCD screen and Adobe Lightroom for editing in camera. Zeiss, which relies on lens production and has an on-going alliance with Sony, unveiled its up-coming ZX1 camera, an interesting device which boasts a 37.4-megapixel sensor measuring 36 x 24mm and an integrated Distagon lens with a 35mm focal length. Built-in Wi-Fi and Bluetooth enable users to connect the camera to the Cloud and upload images as they shoot. The ZX1 has a 4.34-inch multi-touch 16:9 monitor plus a 0.7-inch OLED EVF with a resolution of 1920 x 1080 pixels and a magnification of 0.74x. The new camera comes with Lightroom CC pre-installed, enabling users to convert DNG.RAW files in the camera and either store the resulting TIFFs or JPEGs in the camera (which boasts 512GB of built-in SSD storage) or upload them directly to the Cloud. It’s expected to be available early next year and should appeal to (very rich) smartphone users looking for better photographic performance and image quality. The L-mount Alliance comes at a time of massive change in the imaging market. It’s no secret that camera manufacturers have gravitated to higher-priced models in response to the decimation of the cheap end of the market by smartphones. It’s also no secret that camera buyers are looking towards larger sensors and better image quality. In the next six months or so Canon, Nikon, Sony and Panasonic will be offering cameras with impressive capabilities and persuasive marketing messages to both stills and video shooters. 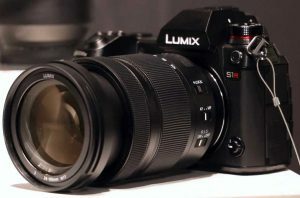 Panasonic’s reputation for video, developed through its GH5 cameras, should attract serious multi-media shooters to its new cameras. Panasonic will be able to leverage its on-going partnership with Leica as it moves into full-frame mirrorless cameras by giving camera owners access to Leica’s very high quality glass. There are two cameras in the pipeline: the entry-level S1 with an effective resolution of 24 megapixels, and the S1R which offers 47-megapixel resolution and will cater for professional users. Both have some attractive features, not the least of them being the intuitive Panasonic user interface and menu system. The Leica involvement will put a nice cherry on the cake. Sigma’s involvement is also worth noting, since the company is already a leader in third-party lens production. This will enable it to build a range of lenses for new cameras using the L-Mount by adapting existing designs. Panasonic announced three new lenses with its S1 cameras, with the range slated for extension to more than 10 in the near future. Sigma is likely to add a raft of converted Art lenses to further extend the range. It will also produce new L-Mount lenses as well as adapters for converting SA (Sigma) mount lenses to the L-Mount as well as adapters for S to L-Mount and Canon EF to L-Mount. Panasonic and Sigma will cater to the middle and upper points in the market, with Leica remaining at the luxury end, thus covering a wide range of potential buyers. Significantly, Sigma will cease production of cameras using the SA mount in favour of the new L-Mount. Sigma has also announced plans to develop the somewhat quirky Foveon sensor with the aim of producing a Foveon-equipped full-frame L-Mount camera. No details were available on its possible release. While membership of the L-Mount alliance gives Sigma fresh fields to explore, it won’t abandon existing commitments. The company announced five lenses at Photokina; four destined for DSLR cameras and one for M4/3 and the Sony E-mount. 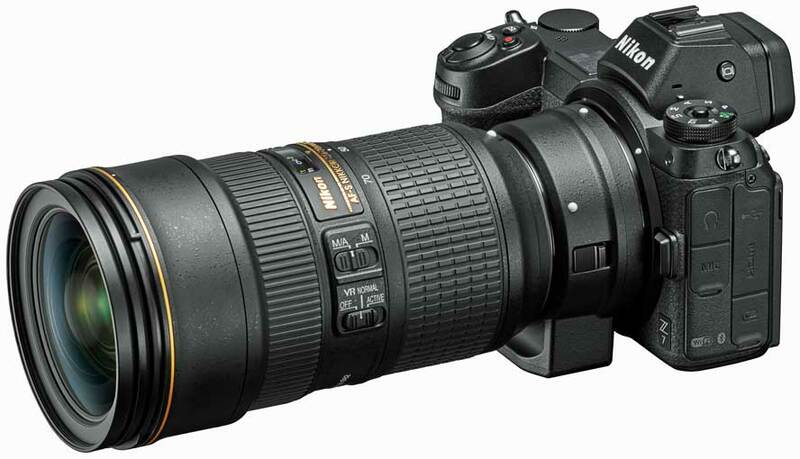 The first to arrive will be the 60-600mm f/4.5-6.3 DG OS HSM Sports lens, which is scheduled for late October. Release dates and pricing have not been disclosed for the other lenses. Geometrically, the differences can be evaluated by drawing a line from the internal ‘throat’ of the lens to the edge of the image sensor. A smaller angle indicates more light is reaching the sensor in parallel, which means better resolution towards the edges of the frame. What these differences will actually mean is debatable, and we won’t get a feel for them until products are available for testing. Over at Fujifilm the first of the second-generation medium format ILCs, the anticipated GFX 50, is about to debut, announced at a price that will challenge Nikon’s Z7 flagship. Concurrent with the latest medium-format camera is the revelation of another one in the pipeline, the ‘GFX 100Megapixels Concept’ camera. It seems Fujifilm is serious about its G Format (43.8 x 32.9mm) image sensor. It’s easy to see the advantages that arise from a sensor that is approximately 1.7 times the size of a 35mm image frame. Features-wise the 51.4-megapixel GFX 50R uses the X-Processor Pro image processing engine and is the first to feature Bluetooth compatibility. It is approximately 145 grams lighter than the GFX 50S (which weighs 920 grams with EVF) and its robust magnesium alloy body is just 66.4mm thick, 25.0mm thinner than the GFX 50S. The camera’s body is weather-sealed in 64 places and includes an organic EL electronic viewfinder (EVF) with a resolution of 3.69 million dots and magnification of 0.77x. The top panel sports two milled aluminium dials, one for shutter speed and the other for exposure compensation. A focus lever allows quick adjustment of the focus point, while the elimination of selector buttons provides extra space to more comfortably hold the camera. The GFX 50R will be a strong competitor to the new wave of high resolution full frame mirorless cameras such as Nikon’s new Z7 model, which has similar resolution. Although they have different aspect ratios, with the GFX 50R being 4:3, while the Z7 is 3:2, the GFX 50R’s sensor has roughly 40 percent more surface area. This means its photosites are larger (5.33 microns vs 4.35 microns for the Z7) – which is significant for imaging performance, particularly for pro photographers, the main target market for both cameras. The GFX 50R will be available in Australia from late November for $7,099 (RRP), compared with around $5500 for the Z7 body and adapter. 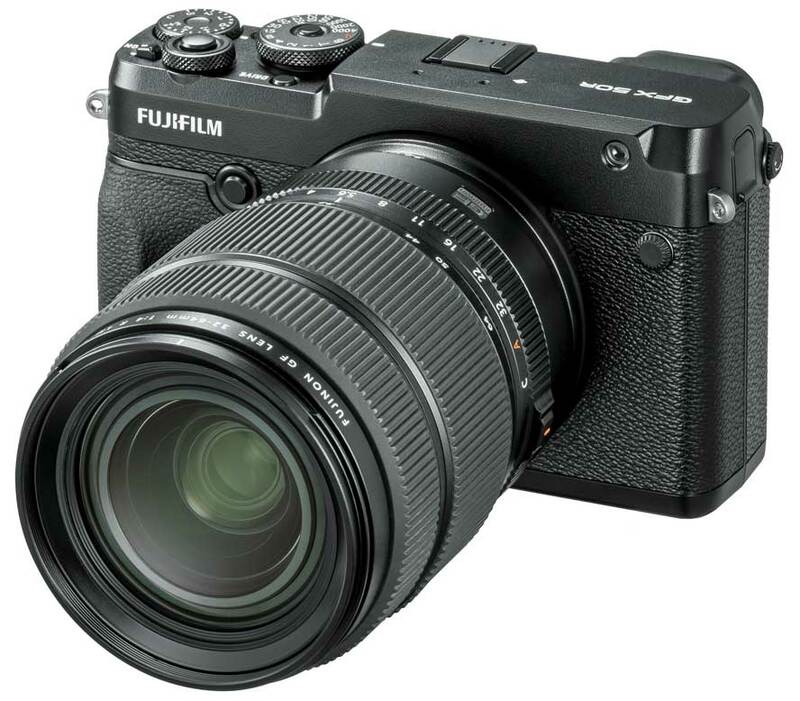 Fujifilm supports its new cameras with a lineup of seven Fujinon GF lenses, covering focal lengths from 23mm (equivalent to 18mm in the 35mm film format) to 250mm (equivalent to 198mm in the 35mm film format). All GF lenses are able to resolve up to 100 megapixels, which means they are effectively ‘future proof’. Additional lenses will be released to bring the total up to 11. Buyers looking for a full-frame interchangeable-lens (ILC) camera will doubtless be wondering which way to turn. While a full-frame camera might be attractive and there will be plenty to choose from, professional users in particular will be wondering whether to stick with 36 x 24mm format when medium format has never been so accessible (and compact). For new entrants to the market, it might be best to wait for the second-generation models when the various systems have matured a bit, the bugs have been fixed, prices are lower and more lenses are available. Lower down in the overall camera market, while camera prices are cheaper, the APS-C format appears to be languishing, with only Fujifilm showing it any love – and that was with the release of the X-T3 in early September. Sony’s last APS-C camera was the α6500, which arrived in October 2016. Perhaps we’ll see either an α6700 or α7000 announced at the PhotoPlus EXPO in New York in late October (when the α7S III might also appear). Neither Canon nor Nikon has made significant investments in developing the cropped-frame format further. Their cameras for the past few years have been mere iterations of previous models with a few ‘new, improved’ features trickling down from more up-market cameras. Canon has the further complication of catering for two different APS-C lens mounts: EF-S and EF-M, which hampers lens developments. Will both survive and, if so, how well will they be supported? If one is dropped, which will it be? Any further neglect of the format by the majors could well see them exit this category.